29th September is the feast day of St Michael. He is said to be the protector against darkness, and so it is natural that his feast day should fall when the nights start drawing in. According to the stories, St Michael was the archangel who threw Lucifer down from heaven. The story says that when Lucifer fell, he landed in a bramble bush and cursed it and all its fruit, and so you shouldn’t pick blackberries after Michaelmas. Michaelmas Day used to be the last official day of the harvest until Henry VIII broke away from the Catholic church. Since then we have celebrated the harvest festival separately. 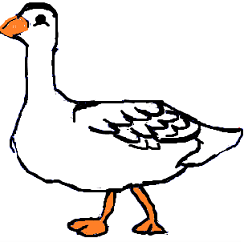 Michaelmas Day was also known as Goose Day because of the tradition of eating goose on this day. The reason why is unclear, but it is possibly because it was one of the Quarter days when the rent fell due. Tenants who needed extra time to find the rent money may have given their landlord a goose as a present when asking for a little leeway. Goose Fairs, such as the famous one which still takes place in Nottingham, sprung up around the country on or near this day. Next PostNext What is Sukkot?